Description: New genuine Acer laptop replacement battery. The specifications for this battery are 3490mAh, 37.7Wh, 10.8V, 3 Cell. This is a high quality original battery. Compatible Part #'s: KT.00303.016, KT.00303.021, KT.00303.022, KT.00303.025, KT.0030G.011, AC14B13J, 3INP5/60/80. 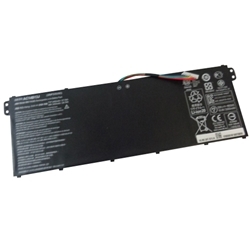 Acer Aspire ES1-131, ES1-331, ES1-512, ES1-520, ES1-521, ES1-522, ES1-531, ES1-731, ES1-731G.